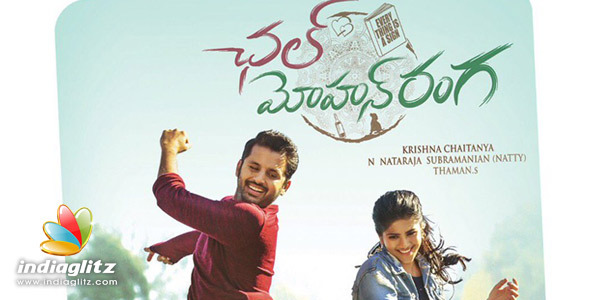 Nithin's 25th film, titled 'Chal Mohana Ranga', is a fun-filled romantic entertainer directed by Krishna Chaitanya. With music by SS Thaman and cinematography by Natarajan Subramanian, it has Megha Akash of 'LIE' fame as the heroine. Set in the US, its story is by Trivikram Srinivas. Naresh, Liji, Rohini Hattangadi, Rao Ramesh, Sanjay Swaroop, Prabhas Sreenu, Narra Sreenu, Madhu Nandan, Pragathi, Sathya, Pammi Sai, Rajasri Nayyar, Ashu Reddy, Vennela Rama Rao, Kireeti, Ranadhir, Neelima Bhavani, Baby Hasini, and others are part of the cast. Dance choreography is by Sekhar VJ. Stunts are by Stunt Silva and Ravi Varma. Screenplay and dialogues are by Krishna Chaitanya himself. The film releases on April 5.